We tend to associate classic crime fiction with amateur sleuths, Wimsey, Sheringham, Marple, and company. In reality, though, police stories abounded during the first half of the twentieth century. The "police procedural" may be thought of as a concept of the Fifities onwards, but Freeman Wills Crofts and others were writing books about meticulous police investigations long before the days of Lawrence Treat, Ed McBain, and Maurice Proctor. Classic police stories are celebrated in my latest anthology in the British Library's Crime Classics series. The Long Arm of the Law charts the development of the police story over more than half a century. The first entry is a very obscure one, "The Mystery of Chernholt" by Alice and Claude Askew. And we come right up to the (relatively) modern era with Sergeant Cluff featuring in "The Moorlanders" by Gil North. I really enjoyed putting this book together. It is, believe it or not, the third of my anthologies that the British Library have published this year alone - and there's one more still to come! - and I like to think that this reflects an increasing interest in short crime fiction. Books of this kind, though I say it myself are a great way of discovering new writers and new detective characters. Anthologies are always a mixed bag, and I do aim for quite a high degree of variety, but there's sure to be something for every crime fan - or so I hope. This book contains, it's fair to say, a higher number of obscure stories than my other anothologies in the series, although several of the authors are well-known names - Crofts, Henry Wade, Christianna Brand, John Creasey, and Nicholas Blake among them. My researches benefited enormously from help given by a number of experts, including John Cooper, Jamie Sturgeon, and Nigel Moss. I leave it to readers to judge the result, but I'm optimistic that this book will provide crime fans with a great deal of entertainment, and some truly fascinating new discoveries. A collection with a short story by Christianna Brand sounds tempting. :) I'm still keeping an eager eye out for 'Foreign Bodies' - which I presume is your final anthology for the year with the BL reprints? Will there be an update regarding the contents of 'Foreign Bodies'? Yes, the fourth and last for this year - more to come in 2018! The final story for Foreign Bodies is still not as yet resolved, as far as I'm aware. Thanks Martin. :) Would this delay the release of 'Foreign Bodies'? Also, I've been awaiting the Kindle release of 'The Story of Classic Crime in 100 Books' - but the ebook doesn't seem to be out yet...? Hi Martin, I bought the book yesterday in Chester and enjoyed reading your introduction and a few of the bios over a cappuccino in the sunshine whilst waiting for my car to be MOT-ed. How heartening it is, this resurgence of interest in short crime fiction. I’m sure the British Library’s Crime Classics series edited by yourself, always presenting such a splendid mixed bag of goodies between gorgeous covers, has much to do with it. 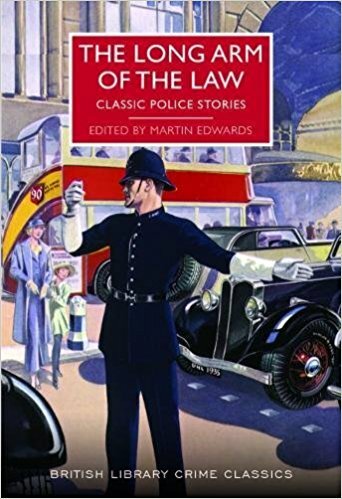 You’ve put together another great line-up in ‘The Long Arm of The Law’, including a few names unfamiliar to me such as Gerald Verner, who dictated his stories to his “silent secretary” and George R. Sims, who I wish I’d discovered before as I might have benefitted from his tonic preventing baldness! Yep, I’m going enjoy this anthology. Hi Jonathan. The publication won't be delayed. I'm not quite sure about the Kindle version of my book, will try to find out. Paul, thanks so much. Very much hope you like the new magnum opus and look forward to seeing you again before long.